FRENCH PRESIDENTIAL FAR-right candidate Marine Le Pen fought off accusations of plagiarism today as supporters of her rival Emmanuel Macron warned that a high abstention rate could hurt his chances of victory. It emerged that Le Pen had copied parts of a fiery speech she made yesterday from one made about two weeks earlier by one-time conservative candidate Francois Fillon, the former frontrunner who was eliminated in the first round of the election. In an address on 15 April, Fillon made specific mention of the geography of France’s borders, paid tribute to the French language and spoke of a third “French way” for the 21st century. Analysis by the Ridicule TV YouTube channel showed Le Pen repeated these passages almost verbatim from Fillon’s speech. Florian Philippot, the vice president of Le Pen’s National Front (FN) party, said it was “not plagiarism”, but “a nod to a short passage in a speech about France”. Le Pen’s spokesman David Rachline said the copied passages in the speech were “appreciated by Fillon’s voters”. Just days ahead of Sunday’s run-off, 39-year-old Macron remains the frontrunner in the race with polls predicting a 19-point lead, putting him on track to become France’s youngest president. Amid concerns in his camp that a high abstention rate could help Le Pen’s chances, company bosses, celebrities and scientific researchers called in newspaper editorials for people to vote for Macron, a former investment banker who styles himself as “neither of the left nor the right”. Macron’s economically liberal approach worries many voters on the left. While they will not back Le Pen, many say they will stay at home rather than vote for him. Opinion polls say abstention could be as high as 30 percent, higher than in recent presidential elections, as the “Neither-nor” camp gains strength. Cedric Villani, a high-profile mathematician and commentator wrote in the left-wing Liberation newspaper today that abstaining “is the equivalent of giving half of one’s vote to Marine Le Pen in the most important election that France has had for several decades”. Daniel Cohn-Bendit, a veteran rebel of French politics, called on supporters of hard-left firebrand Jean-Luc Melenchon, who scored 19.6 percent in the first round, to put aside their “hate” of Macron. “Think rationally and vote for Emmanuel Macron and defend democracy and freedom,” the former ecologist Euro MP told Europe 1 radio. Le Pen and Macron will face off tomorrow in a what promises to be a fiery TV debate when the far-right candidate is likely to sharpen her attacks on a candidate she says embodies “the world of finance, of arrogance, of money as king”. Macron fought off accusations from Le Pen that he was controlled by banks. “I am not under the thumb of the banks. If I were, I would have continued to work for them,” he told BFMTV news channel today. Macron said he had received similar insults from the far-left and far-right for months, “but I’ll look them straight in the eyes and say I don’t have any lessons to learn from them”. In a feisty speech on Sunday, Macron told thousands of his supporters he would defend “free democracy” if voters choose him. He said he was aware that “many people will vote for me to avoid having the National Front”. “I say to them that I am completely aware that on 7 May, I will be doing more than defending a political programme — I will be leading the fight for the republic and for a free democracy,” he said. Email “Marine Le Pen plagiarised one of her rivals in a campaign speech last night”. 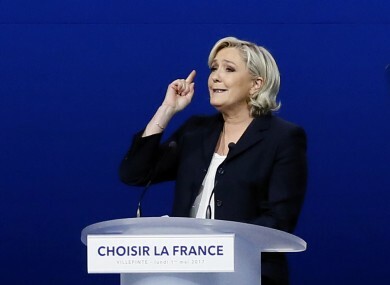 Feedback on “Marine Le Pen plagiarised one of her rivals in a campaign speech last night”.